Shallotte Presbyterian Church has a diversity of active participants including young, middle-aged and retired singles and couples. In the mixture of church life are both Brunswick County natives and people who have moved in from many areas. The congregation is made up of people from many backgrounds and interests. We are a growing congregation dedicated to our members, needs of the community and Gods’ Kingdom here on earth. We look forward to the opportunity to meet you. Look around our website to see the many opportunities for growing in faith and service to God. The Shallotte congregation joyfully worships in a beautiful new sanctuary, which also inspires worshippers to sing praises to the glory of God led by a talented choir. 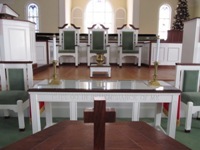 Both the 8:30 a.m. and 11 a.m. services are conducted with dignity in the Presbyterian tradition. During the summer months the 8:30 a.m. service is moved to Ocean Isle Beach where people from all over the United States join in ecumenical worship on the sandy ocean shore.